You can include a parameter in a method whose type is an interface, allowing you to pass interface variables into the method. For example, we can write a method that takes variable of type IMoo. We can now pass into this method a reference to any object that implements IMoo. We could also just pass an instance of a Cow directly into the method. 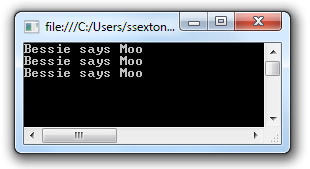 It will be implicitly cast to a reference of type IMoo and so the DoSomeMooing method will have access only to the members of Cow that are part of IMoo.